Williams said this during a post-game media scrum and was referring to the complete implosion that the Hurricanes had just had against the Boston Bruins. In terms of epic meltdowns from the Hurricanes’ perspective, or epic comebacks from that of the Bruins, it was one for the ages. The Bruins overcame a 4-1 Hurricanes lead with 10 minutes left in the game to win the contest 6-4. And the contingent of Bruins fans among the 13,080 in attendance, made those 10 minutes sound like a Bruins home game. The Bruins faced the Hurricanes, stopping by Raleigh’s PNC Arena for what was to be essentially a tune-up as they prepare for the playoffs. 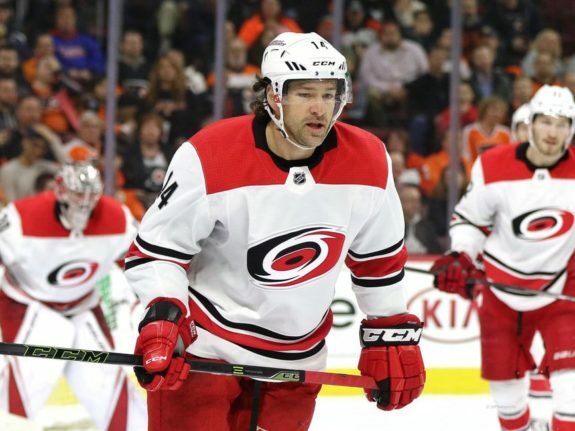 They came into the game firmly in second place in the Atlantic Division, with the struggling host Hurricanes seven points out of a wild card position. These were two teams in diametrically opposite positions. 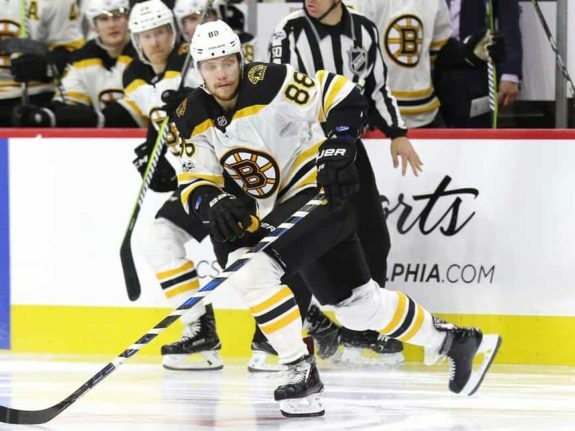 The Bruins looking ahead, the Hurricanes – absent a miraculous run – looking at what could have been. The game with the Hurricanes looked for the Bruins to be a necessary annoyance on the way to the real games that matter in about three weeks. The Bruins were rested, but the Hurricanes were playing their second night in a row. The hosts lost Monday night in yet another fan-frustrating display to the New York Rangers, who put four goals past Scott Darling and added two empty-net goals for a 6-3 victory. The game also had two milestones for the Rangers. 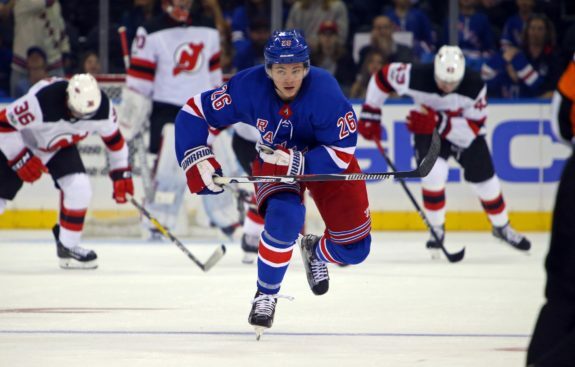 Jimmy Vesey got his first career hat trick and Mats Zuccarello scored his 100th NHL goal. It was a night to forget for the Hurricanes and their fans. Amazingly, though, the “tune up” went off-key, with sour notes galore for the Bruins over the first 50 minutes. They were down 4-1, and nothing suggested that they were going to win. For those 50 minutes, hope-filled the Hurricanes fans that maybe this was the start of something good for their team. All that was necessary was to play out the final 10 minutes and head home with two points in the bag. Then the unimaginable happened, and Canes fans were left dazed while the Bruins fans made the PNC Arena sound like a sold-out TD Garden. Williams was right in saying that Bruins fans were loud in the ‘Canes’ house. It was an instant change of environment in the space of fewer than two minutes in the third period. I’m still kind of stunned really. Things can go so right for 50 minutes and you can dig in and you can do all the things right and you let one goal turn into another one turn into another one. I know what else to say. We gave up three two-on-ones, three-on-two, I took a penalty, I think all but one of which resulted in a goal. We gave them an opportunity with one, they obviously smelled blood and took advantage of it. I don’t really know how to explain what just happened. It’s tough. We made a lot of mental mistakes there and they capitalized. Even among the media the question, “What just happened” was heard. In a nutshell, here is what happened. The Bruins, who had lost three players during the game due to injuries, were down 4-1 with approximately 10 minutes left in the game. Suddenly, a turnover here, a closed-hand pass that was not called by the officials there, and before it was clear what was happening, the Bruins had new life. Matt Grzelcyk, David Pastrňák and Danton Heinen scored consecutively in 77 seconds to tie the game for the Bruins. Then David Pastrňák scored with 3:30 left to give the Bruins the lead and added an empty-net goal for the hat trick. It was a fitting end to a complete disaster for the Hurricanes. The Hurricanes seem to be destined to play out the season like they have for the past decade, hoping next year will be better. It’s certainly believable that after the past two games, it can’t get much worse.